From what I am told by our affiliates in Washington State, there are some forms of herbal substances available in the reigon that are sure to influence cetain individuals to go all the way on things, and a perfect case in point is none other than the adventures of Phoenix Jones, ad real life superhero and crime fighter representing the Pacific Northwest and beyond. via Huffington Post and CNN News. Batman. Spiderman. The Green Hornet. And now, Phoenix Jones.By day, he may be your average Joe. By night, however, one Seattle, Wash. man assumes a philanthropic persona to lend a helping, albeit gloved, hand. 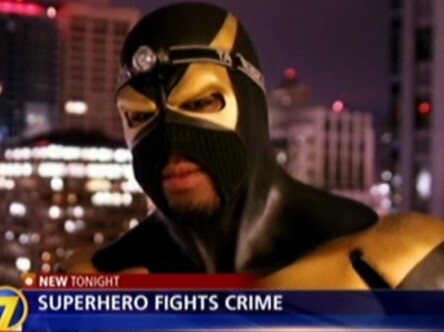 KIRO reported that Phoenix Jones, unknown by any other name, stopped an in-progress grand theft auto recently by chasing away the perpetrator. The would-be victim, who asked to be referred to as “Dan,” couldn’t believe his eyes. “From the right, this guy comes dashing in, wearing this skin-tight rubber, black and gold suit, and starts chasing him away.”Phoenix Jones is no stranger to danger. He said he has been patrolling the streets for the past nine months, keeping what he feels to be evil at bay. One adversary managed to stab him in the past, but he said most of his enemies flee at the sight of him. “When I walk into a neighborhood, criminals leave because they see the suit. I symbolize that the average person doesn’t have to walk around and see bad things and do nothing.”Superman may have his phone booth, but Phoenix Jones opts to use a local comic book store to transform. In November, Jones spoke with the Seattle Post-Intelligencer about his qualifications. He said he understands that with great power comes great responsibility. “I don’t condone people walking around on the street with masks. Everyone on my team either has a military background or a mixed martial arts background, and we’re well aware of what it costs to do what we do.”Yes, he has a team. With names like “Catastrophe,” “Thunder 88” and even “No Name,” they are a part of the Rain City Superhero Movement, a group of nine disguised defenders dedicated to ridding the city of crime. From a PimpHop.com perspective, this is a humongous step in the right direction due to the increase of the need for protection, and as usual and in alignment with natural order, I would not be shocked to see the next batch of female superheros appear on the seen at a point in the very near future with a shift in focus from needing assistance to having it available for those in need.